It makes no difference on human-sized screens. The human eye only has so much resolution. There are all sorts of charts that show you what screen size is best for what viewing distance, but unless you’re spectacularly eagle-eyed you won’t be able to tell 480i content from 1080p content from 10 feet on a 32″ TV. In other words, that TV in your bedroom is probably not big enough to make a difference. 4K TV is four times the resolution of HD. I personally could BARELY tell the difference on an 84″ 4K TV at 6 feet. I compared Blu-ray and native 4K content and there just wasn’t a real, measurable difference. So, unless regular folks start going to 110″ or larger, 4K is just a novelty. It’s a bragging right, nothing more. Maybe at some point people will get TVs that big… after all ten years ago 37″ was considered HUGE. Until then, people will skip 4K. Sony now has a box that will download up to 45 movies in 4K, and they have some choices for you. But THAT’S ONE STUDIO. No one else is putting out that content for you. It doesn’t matter either because in today’s “watch instantly” society, very few people have the ability to stream at a sustained rate of 75-100 megabit, which is what it would take for high quality 4K video. So you’re downloading the thing overnight and watching it tomorrow? Does that sound what people do? People haven’t “really” even switched to HD yet. We’re a decade into HDTV and there are tons of people out there who watch SD programming on their big flatscreens because they can’t find the HD versions at the end of the guide on their cable boxes. These same people stream Netflix and think it’s as good as Blu-ray. (It isn’t.) 4K is totally lost on these people and they won’t spend extra money for something they can’t see. The other day I was in a big-box electronics store and the demonstrator was showing off that big Sony 4K TV and two people in a row asked him to pop in a DVD — not a Blu-ray disc — to see how that content would look on the 4K TV. These people are more worried about SD than anything else. I can’t imagine them spending a ton on a 4K TV. The smoking gun… even home theatre installers aren’t sold. In other words… it doesn’t matter if you want 4K, you’re going to get it because TV makers say so. Has that ever been a recipe for long-term success? Even if we look forward a year or two and there is 4K content through gaming consoles or streaming boxes, there’s still no reason to think people will want it. That doesn’t matter because the whole television-industrial complex is “fully committed” to making sure you get it. Why are those manufacturers so committed to your loving 4K, other than the obvious profit motive? It turns out that it’s actually easier to make a 4K TV in a really large size than it is to make an HDTV. At a certain point it’s hard to get the pixels so big, so HD becomes a pain in the neck to engineer. 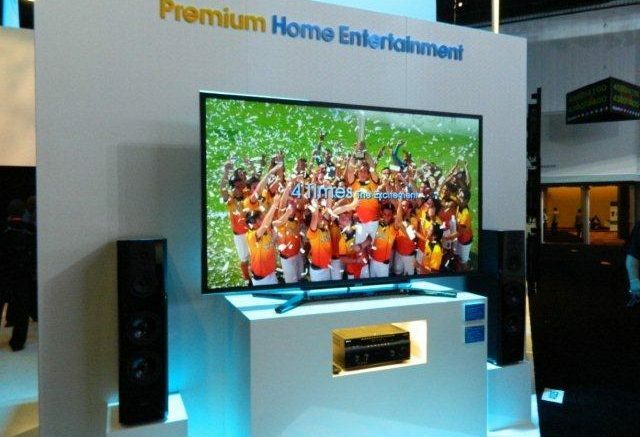 TV makers want you to pay more for 4K because it’s a win-win for them. Didn’t they learn anything from 3D? The biggest lesson that TV makers should have learned from HD is that people won’t buy something unless it makes the experience better. 3D gave people headaches as they sat in dark rooms and looked at flickery 3D TVs. No one bought it, and while you can still get a 3DTV today, you won’t pay anything extra for it. 4K may come but it’s not going to succeed until the price of a 4K TV is the same as the equivalent HDTV, so it won’t make a difference. If you disagree, I’d love to read your comments. I’ll be skipping the 4K revolution until prices drop to today’s HDTV levels. I just don’t see the point in paying more.